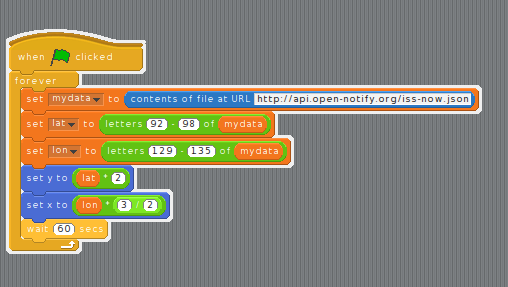 This is just a very short post for the Naas-Sallins Coder Dojo about a smaltalk clone of Scratch called Phratch. As the website says “ It includes two interesting categories: Files and colors. 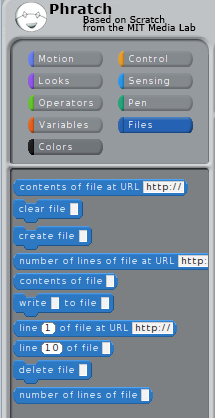 Files allows one to manipulate local and remote files, and Colors to manipulate color features”. So in this quick post we are going to have a look at the files extension. we set the variables lat and lon to a particular range of characters in my data. I did this by trial and error and its a bit rough and ready. So as you can see the ability that phratch has to interact with a file or a url opens up a whole new set of interesting opportunities. If you are interested you can download phratch here. This is part two of a post for Naas-Sallins Coder Dojo about the International Space Station. We assume you have worked through part one and in particular have successfully installed the python libraries required. The install instructions for basemap and its dependencies are here and maybe here if you are on a Mac. Our intention is to use this library to plot the position of the ISS on a map using python. As the introduction to basemap says “the matplotlib basemap toolkit is a library for plotting 2D data on maps in Python.” It comes with a whole set of projections which are listed here. 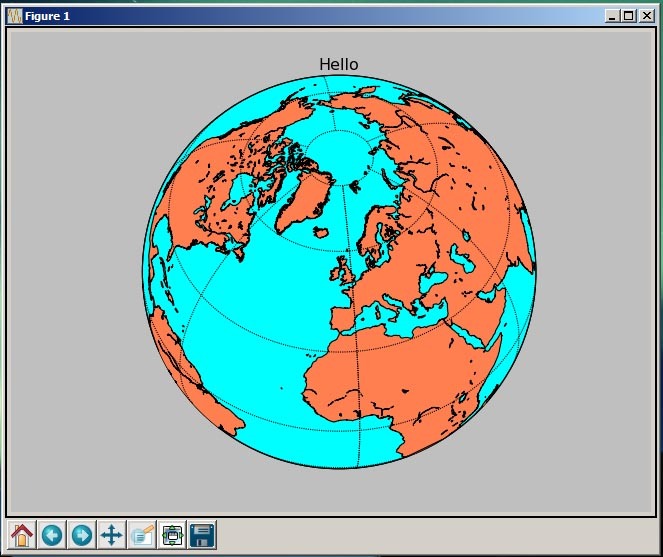 A projection is a way of representing the curved surface of the earth on a 2d map. If you click on any of the linked projections you will see the python code required to produce it and the map itself. The first thing we need to do is make sure that everything is installed ok, as is the tradition we will do this with a hello world program.
""" 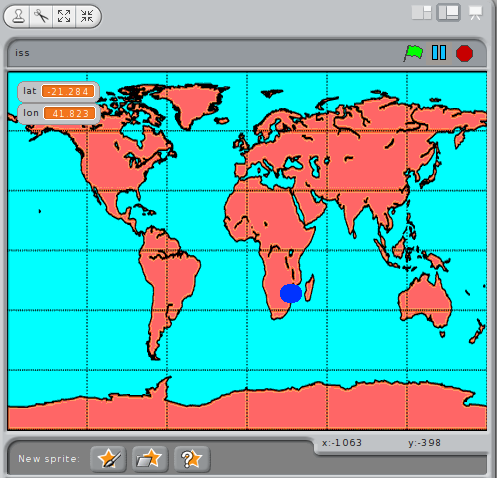 Hello World Check basemap is ok"""
# lon_0, lat_0 are the center point of the projection. # resolution = 'l' means use low resolution coastlines. # draw parallels and meridians. This code is straight from the example for orthographic projections with the title changed to give us ‘Hello’ with the world underneath, and the latitude and longitude changed to center the map over Naas. Our next step is to find a way to plot a point on the map. # plot coastlines, draw label meridians and parallels. So this time we are using the json values returned by our getiss() function to plot the point on the map. At this stage we have an application which can draw the current position of the ISS on a map of the world which shows the power of the available python libraries. All that remains is to add some bells and whistles to our map and get it to update the position of the ISS. The code for this is below and it is mainly taken from the examples on the basemap website. We can discuss all this and play around with the various map projection options at the next few dojo sessions.
""" plot the ISS and update every 60 seconds"""
# map shows through. Use current time in UTC. 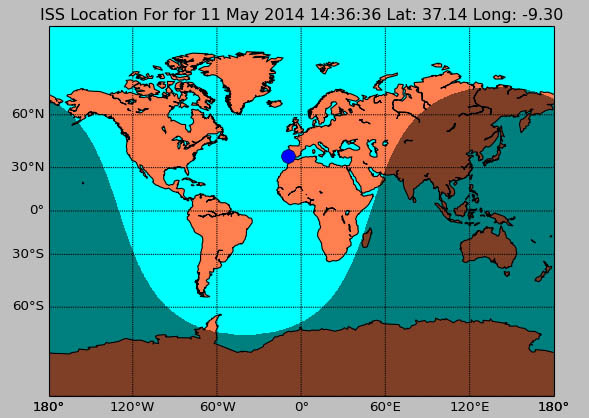 This code gives us a real time ISS tracker showing a map of the world with day/night shown that updates every minute. To stop the app hit crtl-c in the command window where you started the application. If the ISS is over land and it is daytime then you can have a look at a video stream of what it can see here.
""" Python ISS for @NaasCoderDojo using tweepy and open-notify.org """
""" Get current ISS position from open-notify.org"""
If you want to see what the ISS can see take a look at this link which is an actual case of Hello World! If you dont see anything then read the text which will explain why. There will be second part to this ISS post which requires the installation of some python libraries so it would help if we can try to follow the instructions here and maybe here if you are on a Mac. The plan is to build an application which plots the current position of the ISS and displays it on a map. As usual we can have a look at any problems at the next dojo session.